Happy Friday all you peeps! I have a lovely home for y’all to snoop around today. The Endearing Home – after snooping around Lauren’s home, I think you’ll agree that her blog is very aptly named! Hi everyone! I want to start by saying a great big “THANK YOU” to Suzy for inviting me to be a part of her House Snooping series, it is truly an honor! I adore Suzy’s blog and was so happy to meet her in person when she hosted the Hometalk “From Downtown to Downton” meetup in Greensboro. It was such a fun day! I’m Lauren from The Endearing Home. Since starting my blog back in October I have been enjoying sharing budget friendly decorating ideas, updates to our home and meeting so many wonderful people along the way! We moved into our home two years ago and have slowly been making progress on the project “to do” list. We still have lots to do and plans to improve the house, but it is finally starting to come together and feel like home! So welcome to North Carolina and hope you enjoy the tour! When you step inside the front door there is a tall foyer. We recently had the foyer painted, added crown molding and bead board. I also put together a gallery wall. I am still looking for a light fixture and would love to replace the carpet on the stairs with wood someday. You can see the foyer updates here and here. Since I took the photo above I have changed things a bit on the table. Most of the furniture stays in place around the house, but I always have fun moving the accessories around. To the right of the foyer is the formal living area or as it is now known, Mac’s room. Our poodle loves to lay on top of the cushions to take his many naps or looking out the window waiting for us to come home. The sofa and chair honestly never look this neat, the tops are always squished in. I gave up on trying to fluff them unless we have company. Click here to read more details about the living room. The dining room and living room are one big open space. Several months ago I painted both of the rooms and had “faux” wainscoting added to the dining room, you can see the before and after and more details here. Each room has it’s own look, I tried to make them work together the best I could mostly with what we already had from our previous home. The dining room connects to the kitchen and family room, the true heart of our home. We were lucky we didn’t have to make any major updates to the kitchen, just simple and inexpensive changes to give it a new look. You can see more of the kitchen here. For me, an open floor plan is a challenge to decorate because I like to coordinate things around the house and that isn’t always easy with this type of layout. I went with black and white because of the kitchen, it just seemed to work. By adding lots of black and white accessories in each room it helped to tie the two spaces together. 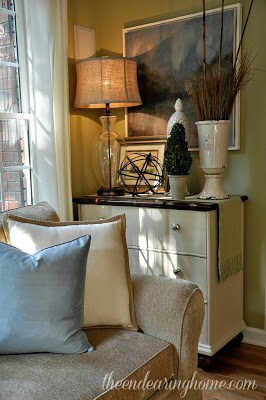 Come see more of the family room updates here. I found this chair at Home Goods, it was a gift to me from my hubby for Mother’s Day. This is my husbands chair. The last room to share is our guest room or “Grandma’s room”. This is one of my favorite rooms in the house. Our home has come a long way since we moved in two years ago, but with an unfinished project in just about every room there is still so much to do and share. Hope you will stop by The Endearing Home to say hello and see what’s new at our house! Thank you so much Suzy, I had so much fun sharing our home tour on your blog today! Have a wonderful weekend! Thank you so much, Lauren, for letting us snoop around your home today! It is truly a lovely and inviting home. I think I could move right in! Did you know that House Snoopers has been snooping around other peoples homes since the beginning of 2013? We’ve snooped around all kinds of homes! Oh Suzy, I love this home, it is so warm and inviting. There are so many beautiful details, love that chair from HG and the lampshade next to it is beautiful!! Pinned by the way that chair and lamp really grabbed me! Suzy, Thanks for allowing Lauren to share her home! What a beautifully styled and very welcoming space. I love checking out all of the home tours you share. So much fun! What a luvly home Lauren. Thanks for letting me snoop around. Thanks Suzy for the opportunity. Have a wonderful Friday ladies..
Lauren and Suzy, you did a great job! It’s a beautiful home and I really would like to have that piano! Lauren’s home is beautiful. It’s so warm and inviting. Such a pretty home! I love all the black and white and the beautiful vignettes! I so love Lauren’s home…it is so very warm and inviting with so many special touches and great attention to detail….Lauren has truly mastered the art of creating a beautiful home! Thanks Suzy for another great home tour! Thanks so much everyone and thanks again Suzy for including our home tour in your House Snooping series, it was lots of fun! I was super excited to add your “featured” button to my blog : ) Have a great weekend!!! 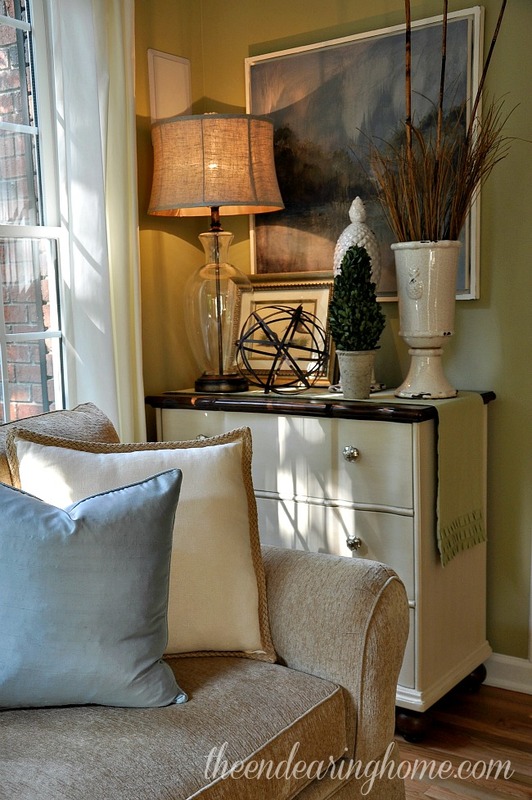 Lauren has a gorgeous home … so very inviting! I love the color palette and her vignettes are beautiful! Thanks for sharing, Suzy! Suzy, Thanks for sharing Lauren’s beautiful home. I am on the way over to see more. Really love your home design. It reflects a lot of what I like with using black as an accent. Lovely! So glad you featured Lauren’s home. I really love how she put it all together and her use of the color black as an accent. I always try to use something black in my rooms. Lovely home. Lauren’s house is surely gorgeous! Within a span of two years, it has definitely become a stunning “work of art.” Every furniture and accent simply blends with the room’s ambience. Anyway, this is a great post. Inspirational, if I may say. Love her style! Any idea where she found the black and white check pillow and the Monogramed pillow? I have the perfect place for both! Beautiful – so many wonderful ideas! Thanks so much! That dining room table and hutch, breathtakingly beautiful! Love all your decor!! Such talent!! Hi Suzy! I’m Shelia Parker and I follow your blog. I was on Pinterest and was looking at your post about Lauren’s home at the Endearing home and I decided to sign up for her blog. Well, madmimi said that something was wrong with her website and to let the blog owner know that there was a problem. Just thought you might want to let her know since I can’t sign up, in case she’s losing blog followers, that could be the problem. Just wanted to let you know! Love your blog by the way! 😁. Enjoy the rest of your week!